Many high school athletes across the country try to work out on battered equipment and broken machines in dark, run-down weight rooms. This Giving Tuesday, November 28th, why not reach out and give them a hand? "Mens sana in corpore sano": A healthy mind in a healthy body. The ancient Greeks believed it was essential to cultivate a mind capable of positive, free thinking inside a body that is healthy, strong, and free of disease. Fast-forward about 3,000 years to modern times. Many high schools in the U.S. find themselves strapped for money, and spend what little they have on academic needs. These schools can only watch helplessly as their physical-fitness facilities fall into disrepair. Enter the Lift Life Foundation. Bodybuilding.com’s nonprofit foundation is dedicated to giving underserved students access to the equipment they need to improve their fitness levels, boost their self-worth, and become the best versions of themselves, both physically and mentally, through exercise. 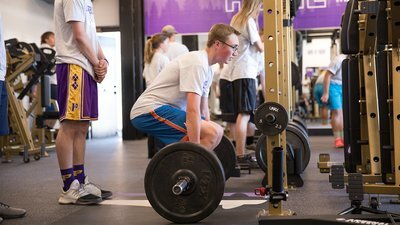 Since January 2016, the foundation and its partners have remodeled the weight rooms at four U.S. high schools, improving the lives of more than 3,200 students. And they've done it all for free. Each weight room that the foundation staff remodels and equips with state-of-the-art strength-training equipment represents an investment of approximately $300,000. To provide more of these life-changing facilities, Lift Life is seeking donations from individuals and organizations across the country. With your support, the Lift Life Foundation can enable more needy schools to provide clean, safe, and well-lit spaces where underserved students can build positive, healthy minds in strong, healthy bodies. Join people around the world supporting good causes on Giving Tuesday, November 28th. Donate now to Life Life Foundation and make a difference for years to come.